Colleges and employers alike understand that a college education alone is not enough to fully prepare graduates for the workplace. More and more undergraduate degree programs now require work experience as a major completion requirement because employers are looking for candidates with work experience in the field. Internships, apprenticeships, and entry-level work experience are necessary to turn the theory and skills that students learn in the vacuum of the classroom into practical application in their fields of study. At the same time, more and more jobs require a bachelor’s degree as a minimum requirement for qualification. This is because with high employee turnover rates and an unpredictable economy, companies and organizations are loosing employees after investing in their training. For this reason, employers now expect candidates to come to the interview trained in the theory and skills of the field, as well as with workplace experience. College is not enough. Work experience is not enough. Balancing a full course load with an internship causes many bachelor’s program students to complete their degrees in five or six years instead of the classic four. This means two to four extra semesters worth of tuition costs and student loans. For this reason, many students are dropping out of college under tremendous debt without a degree. These students, however, have years of experience in the classroom as well as in the field. All that is missing is the degree. If this situation rings all to true to your life, you have options. 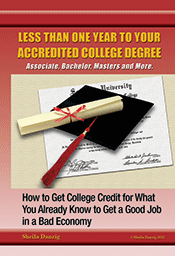 You can have your college education and work experience evaluated for bachelor’s degree equivalence. To learn more, visit us at www.thecareerpeople.com.